We did pretty much zero planning before we left and I ended up spending something like $7,000 (which would be more like $5,000 using today's exchange rates) for the whole trip, which is pretty good, but there were a lot of things I planned to improve on my next trip. 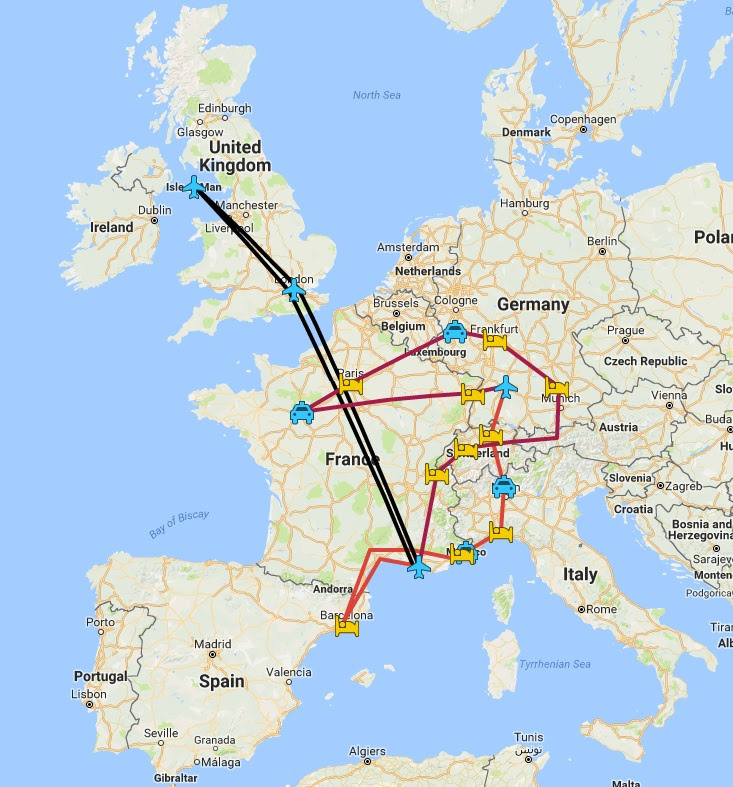 Our 2014 route, starting and ending in Stuttgart. We were very comfortable (most of the time) and ended up spending about $10,000 (about $8,000 at current exchange rates) for both of us, which actually works out to a similar cost per person per day to my previous trip when I was mostly slumming it in hostels. I know this is still quite a bit of money, but there is a lot of room to spend less. For example, you don’t need to attend (and buy tickets to) multiple expensive auto/motorcycle events. Anyway, here are a few tips that will help you save money on a fabulous European vacation. The biggest takeaway from my first trip to Europe was the realization that we should have done a little more planning ahead of time. We wanted to be fun and spontaneous, but we ended up spending a lot of our valuable vacation time in internet cafes stressing over what city we would visit next, where we were going to sleep in that city, and how we were going to get there. It wasn’t ideal. 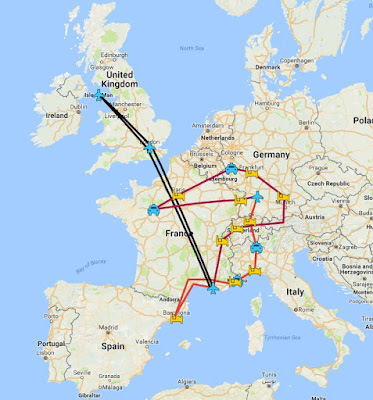 For our most recent trip to Europe, I took that experience to heart and did a somewhat insane amount of planning. After realizing a plan for every day wasn’t going to be detailed enough, I went down to every four hour increment. This probably isn’t necessary for most trips, but our itinerary was ridiculously complicated in order to make it to all the motoring events, so the crazy planning proved to be very helpful. In general, I recommend knowing where you will be sleeping every night of your trip and have a good idea of how you will get there. This might not save a ton of money (although it can), but it will save a lot of vacation time and frustration. Airfare is probably going to be the single biggest expense of your European vacation, with tickets often around $1,000 per person. Without resorting to annoying airline/credit card miles, there isn’t an easy way to reduce or avoid this expense, so the best option is to maximize your airfare value. What I mean by “maximizing” your airfare value is to stay as long as possible in order to get the most out of your airfare. For example, if you spend $1,000 on your flight to Europe and stay for a week, that flight is costing you $142.86 per day of your trip. If you stay for two weeks, that cost will be cut in half, to $71.43 per day. Basically, the longer you can make the trip, the better. Another problem with shorter trips, beyond spending more per day on airfare, is you’re also spending a much larger percentage of your vacation time on an airplane, which nobody enjoys (unless you take advantage of the next tip). You won't be this happy in Coach. On our last trip to Europe, my good friend gave us upgrade certificates for our flights, so my wife and I were able to fly Business Class for Economy prices. This tip actually cost us a bit extra, because we had to buy a slightly higher Economy fare class (which is total BS), but it was some of the best money I’ve ever spent. A word of caution: if you’ve never flown international business class before, you might not want to try it. There’s no going back to economy once you’ve had a six course meal and a lay-flat seat on a long flight. I know I’ve discussed my aversion to air miles credit cards, but lots of us have that friend who is a salesperson or a consultant and have more miles than they know what to do with, so ask them nicely if they would be willing to help you out with an upgrade. If a friend does hook you up, I recommend you treat them to a nice dinner or bottle of wine to say thank you. Another option to get an upgrade is to use miles you’ve accumulated through business trips that your employer paid for. Don't bring anyone who will make you hold their purse. This is one of the biggest money saving tips, but it will have a big impact on your trip. It might be a little controversial too; however, it’s one of the few ways you can cut many expenses by half, or more. All you have to do is travel with one or more companion. Preferably someone you are very comfortable with. This won’t always save a lot of money, but it definitely can. For example, on our latest trip to Europe, my parents joined my wife and me, so we got to split most of our lodging costs with them. We had to pay a little more to find places that could accommodate four adults, but when we cut the price in half, we enjoyed significant savings. My serious face and Chrissy's happy face, on the Nurburgring. This tip only really applies if you plan to visit several different cities on your trip, and is most effective with more people, but it worked out very well on our last trip. Renting a car wasn’t cheap, but it saved us quite a bit compared to what we would have paid for train/bus/air fare between all the various cities for four people. The other big advantage of having your own car is flexibility. If you have to be at the train station or airport at a specific time, your schedule must be very strict and even stressful. For me, this will tend to kill half a day every time you travel to a new city because you have to pack up, make your way to the transit hub, and make very sure you’re not late, which means you will probably show up too early and sit around for a while. Knowing you can take your time and leave whenever you want makes for a much more enjoyable experience. Overnight accommodations are one of the larger budget items for any vacation, so it’s important to save as much as you can. The simple thing we did in this area was to use Airbnb. It was significantly cheaper than hotels and the accommodations were far superior. We rented entire apartments in the hearts of the cities we were visiting and it was wonderful. If you haven’t yet done so, give Airbnb a try. If you use this link you can earn $35 off your first stay (we will earn $35 credit as well). Huddling for warmth, but having a blast. Not all of our overnight stops were super luxurious. We actually did some camping on our last trip to Europe. On the Isle of Man, we stayed on a soccer field and at Le Mans we slept next to the race track. Lugging camping equipment everywhere we went wasn’t fun, and the facilities were quite modest, but the prices were very cheap and the camping was one of the most memorable parts about the trip. Don’t be afraid to be creative and step outside the norm. You can save money and have experiences you never thought you would. As you probably know, whenever there is a big event in a city, all the establishments that cater to tourists and visitors tend to raise their prices. This is most obvious with hotels, but other businesses do the same thing. We avoided these high prices near the events we attended by staying in a nearby town and driving to the event. For example, hotel prices are astronomical in Monaco for the dates surrounding the Grand Prix. We avoided paying those prices by staying in Genoa, Italy the night before the race and in Nice, France the night after. If we were relying on public transportation, this wouldn’t be feasible, but with a rental car is was easy. While I highly encourage you to limit your technology use on vacation, I do think it’s important to stay connected while traveling for a variety of reasons, including contacting Airbnb hosts. There are plenty of open Wi-Fi networks out there, but I recommend bringing your own mobile internet connection. In 2014 we rented a Wi-Fi hot spot that worked throughout Europe for $60 and it came in very handy several times. Another option is to buy (or borrow) a SIM card that works in the location(s) you are visiting. In preparation for this post, Chrissy and I were talking about our trip and realized we couldn't remember many of the details, so Chrissy dug out the journal she kept on the trip and we had fun reminiscing. Thus, I recommend you take some quick notes during your trip so you can remember all the amazing things you saw and did. It doesn't have to be anything fancy; just write down the highlights of each day. For Chrissy, that mostly involved writing about whatever we ate. I'm sure you will appreciate having that record of your adventures sometime down the road. Our splurge B&B in Paris. This final tip is somewhat counter to this entire post, but I think it is important—don’t worry about saving every last penny. You are on vacation. Having a good time should be your top priority. Don’t spend like a drunken sailor, but you can treat yourself. You probably don’t take big trips often, so let your hair down and have fun. The easiest way to do this is to set a reasonable budget before your trip and stick to it. If you’re under budget, feel free to have another gelato, or take that dinner cruise down the Seine. If you’re over budget, find the nearest “football pitch” and set up camp. Either way, you’re probably going to make some great memories. Those are my tips for having a great, budget friendly trip to Europe. If you have any others (that don’t involve credit card churning) let me know in the comments. One of the most important steps to becoming Fiscally Free is to track your expenses. Personal Capital makes that super easy, and best of all, it's FREE. It automatically pulls transactions from your financial institutions and analyzes them for you. There's also top-notch security, so your information is safe. Personal Capital is much more than an expense tracker. It has a number of advanced tools to track and analyze your investments as well as your net worth. It is a great resource, and the price is right. I highly recommend you try Personal Capital today. You'll be glad you did.